Only the most brilliant illustrators can pull off a completely wordless book, and Stephen Savage has such talent in spades. 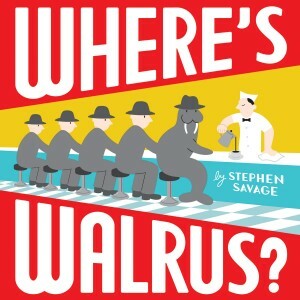 In his adorable book, Where’s Walrus?, not a word is needed as the titular walrus escapes from the local zoo and quickly disguises himself among a whimsical bevy of scenarios. Hidden among men in fedoras at the counter of a diner? Check. Hidden among Rockette-like dancers in a kick-line? Check. Young children will delight in the exercise of finding the walrus is a delightful array of places and older children and adults will love the retro look and feel of Savage’s colorful illustrations. It’s as if Mad Men met Where’s Waldo at the zoo one day and decided to write a book. This is Savage at his best.